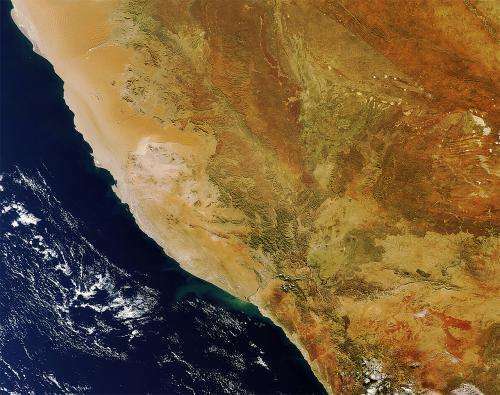 (PhysOrg.com) -- This Envisat image shows southern Namibia and northern South Africa on Africa's lower-west coast. We can clearly see the sand dunes of the Namib Desert  considered to be the oldest desert in the world. Partially located within the Namib-Naukluft National Park, it is also the site of some of the worlds tallest dunes, rising over 300 m in height. These dunes slope down into the Sossusvlei salt and clay pan. To the south of the desert is the Sperrgebiet diamond mining area. Between them is Lüderitz, a German-colonized town that was prosperous in the early 20th century after the discovery of the gemstones. Further south, the Orange River forms part of the border between South Africa and Namibia before emptying into the Atlantic Ocean at Alexander Bay, which is noticeable by a lighter green color in this image. Two towns lie on either side of this river: Namibias Oranjemund on the north shore and South Africas Alexander Bay on the south. Both were established in the early 20th century to service the diamond mines. This image was acquired on 4 July 2011 by Envisats Medium Resolution Imaging Spectrometer in full resolution mode.